Note: I actually had this post ready over a week ago but other topics kept bumping it back. I mention this now only to explain some discrepancies in the time/dates discussed in the post. 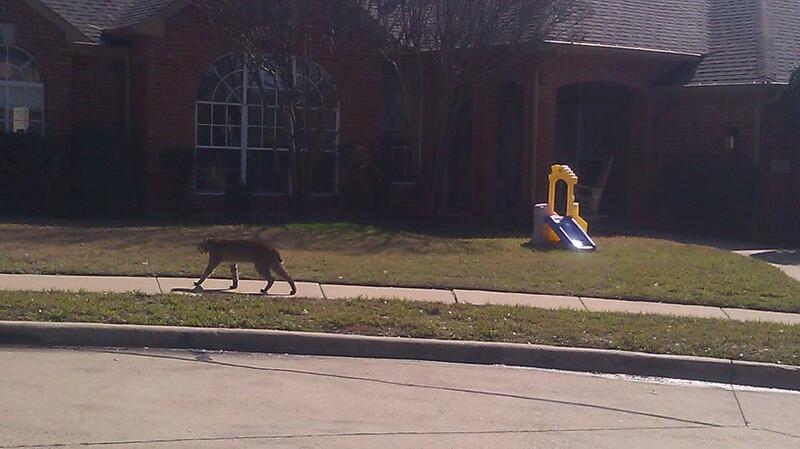 I mentioned here a few days ago that a mountain lion had been spotted just north of Temple, TX. The spot where the lion was seen is very close to the area where a pair of horses was killed two summers ago and where a calf was taken by some sort of predator just last week. I’ve had cameras up in the area periodically for almost two years. I’ve captured all manner of wildlife on those cameras but have yet to get a photo of the big cat I suspect is responsible for these incidents. Once I got wind of the latest sighting, I wanted to waste as little time as possible in getting my cameras back up in the field. I was frustrated in my efforts by some poor and rainy weather but finally was able to get out and post the cameras two days ago. The cameras are on the same property as before; however, I have changed tactics just a bit. In the past, I’ve posted cameras overlooking a dry creek bed. This proved to be effective as I got a lot of photos of various types of wildlife. Coyotes, raccoons, bobcats, herons, opossums, and river otters all got their pictures taken. The problem was that occasional flooding took out several cameras. These things aren’t cheap and, despite the fact that I was getting a lot of good shots, I got tired of that pretty quick. In addition, while I did get pictures of bobcats walking the creek bed, I got a lot more photos of them on a game trail that parallels the creek. All that being the case, it was an easy decision to post the cameras on the game trail above the creek and, hopefully, out of harms way. I may miss some shots of other animals but I think I have a better chance of getting the cougar photo, assuming it is still anywhere around the area, on the game trail. I also changed tactics and placed one camera in an area away from the creek. This camera is in a wooded area near a power line right of way and the remains of an old barn that, I suspect, is used as shelter by various animals from time to time. I found a pretty nice game trail cutting through the area and have the camera looking right down it. Something is walking the area on a regular basis and it will be interesting to see just what it might be. We’ll just have to wait 4-5 weeks to find out. I did something different while out setting up my cameras this time around. I decided to attempt to film the outing so that I could share the experience a bit more effectively. I have actually had some readers email in and suggest I start a YouTube channel on which I could share some of my experiences. I have always tried to post a lot of photos on the site to accomplish just this but realize there is no substitute for video. So, partially inspired by a “Survivorman” marathon, I decided to give the video a try. Filming the actual outing turned out to not be that big a deal. I did not lug around a tripod so, other than my hands, I’m visible only in the opening and closing sequences of the video (that may not be a bad thing, haha). What turned out to be a much bigger pain was editing the video. I work exclusively on a MacBook Pro (I’m not being paid to say that, unfortunately) and the only editing software I have came preloaded on it (iMovie). That would be fine except my JVC hard drive camcorder outputs only .MOD files which, you guessed it, is incompatible with iMovie. So, I had to search for and download some video editing software. It took a little while to figure out but once I got all the video files converted to something compatible with iMovie it went ok. The resulting effort is a bit crude but it does, I think, give you a better idea of what the area I’m working in is really like. I had to cut some material from the final edit as the video would have exceeded the maximum 15 minutes YouTube allows (I found out only AFTER the final edit that you can circumvent this limitation) so there are a few spots where the transitions aren’t too smooth. I have not learned to use all the bells and whistles of the iMovie software so don’t expect high-end production values. That isn’t my goal anyway so it is ok. I just wanted to provide another way to share my “adventures” with readers. Below is the first installment of “TCH TV” (I did preview some software for free and that is why the annoying watermark remains in the upper left corner of the video for its entirity). I would appreciate some feedback on the video. It isn’t a huge pain but does take some effort and time to do. Let me know if you feel video documentation of my outings are worth the trouble or if photographs are sufficient to convey the experience. I’ll look forward to hearing from some of you. 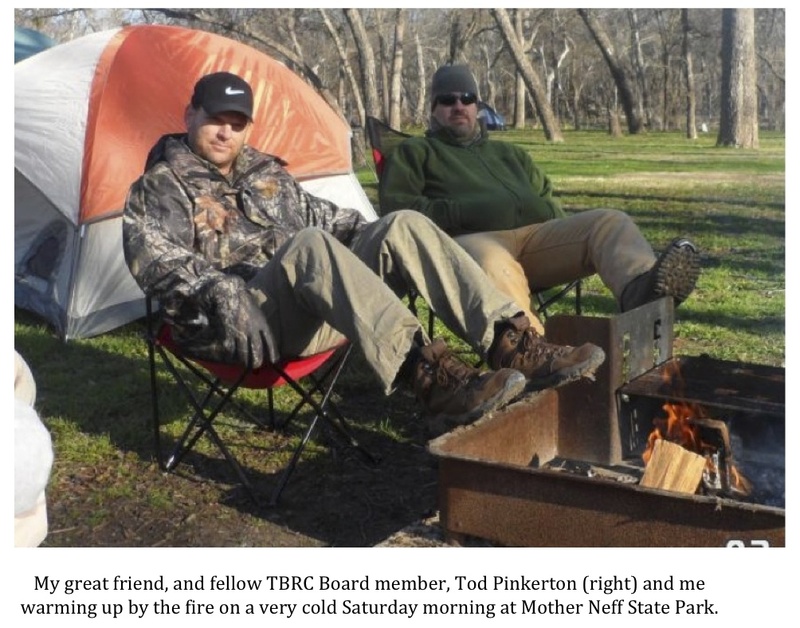 The Texas Bigfoot Research Conservancy (TBRC) held a training camp this past weekend at Mother Neff State Park in Central Texas. 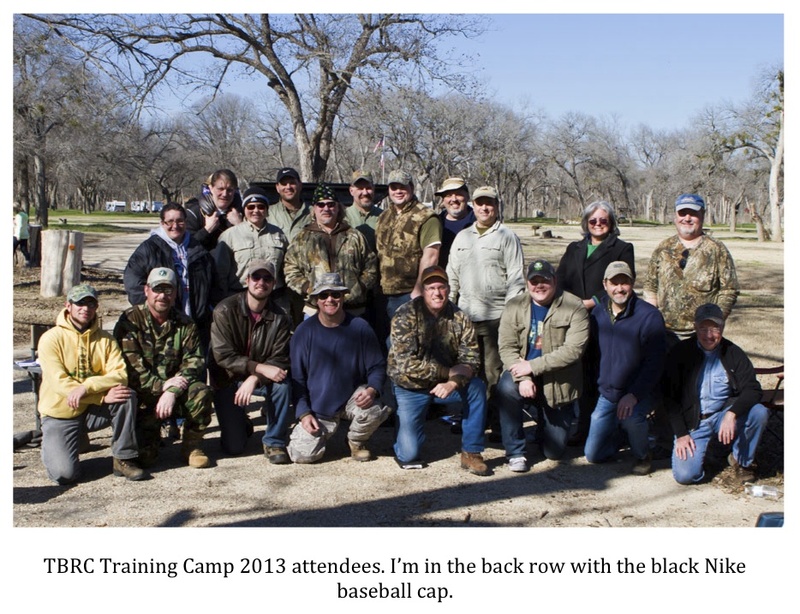 * The TBRC holds at least one training camp per year for new members. It is a great way for new members to meet some of the existing members and to get fully up to speed on TBRC protocols and expectations. I should first tell you a bit about the TBRC membership process. TBRC membership consists of two tiers: Associate Members and Investigators. Incoming members come into the organization under the Associate Members umbrella. Associate Members have access to the group’s general forum, receive free admission to the annual conference, and build tenure but are not required to meet any investigative or field research requirements. Associate membership allows many people from different areas of the country, and the world, to contribute to the TBRC’s cause through payment of annual dues, by providing assistance at the annual conference and by taking part in other TBRC events (including sighting investigations). Associate membership is a level suitable for those who are unable, for whatever reason, to participate in rigorous field work while also providing an opportunity for new members to “get their feet wet.” Most new members, however, desire to move up to the Investigator tier of membership. In order to be considered for a promotion to Investigator status, new members must meet a set of requirements. One of these requirements is attending and completing a training camp. I have to say that I was quite impressed by the new crop of Associate members. An infusion of new blood with new ideas is always a good thing but these folks were exceptional. I very much look forward to getting to know each of them better and working with them in the field very soon. If you are interested in TBRC membership please visit the www.texasbigfoot.com and click on the “membership” link in the upper right hand corner and fill out an application. We are always on the lookout for good, intelligent, and motivated people. This is an exciting time to be in the TBRC. 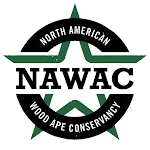 *Please do not email or contact me and tell me that there are no wood apes at Mother Neff State Park. The location was not chosen for actual field research possibilities but for its convenient central Texas location. Bobcats were slower to adjust to urban sprawl than coyotes but seem to be doing fine now. Is it possible larger cats are figuring out how to live near, and even in, cities? I haven’t been able to post anything for a few days so I thought now would be a good time to give everyone a brief update on what has been going on and what I have been up during that time. I’ve actually been quite busy. If you keep up with the blog you know that I had a reader email me saying he had hit a large black cat with his vehicle while traveling a central Texas highway. While this individual did not stop to see if he had killed the animal, he did collect a fair amount of black hair from the bumper and grill of his vehicle upon arriving home. He mailed the hairs in question to me and I have forwarded them on to a friend of mine for microscopic analysis. 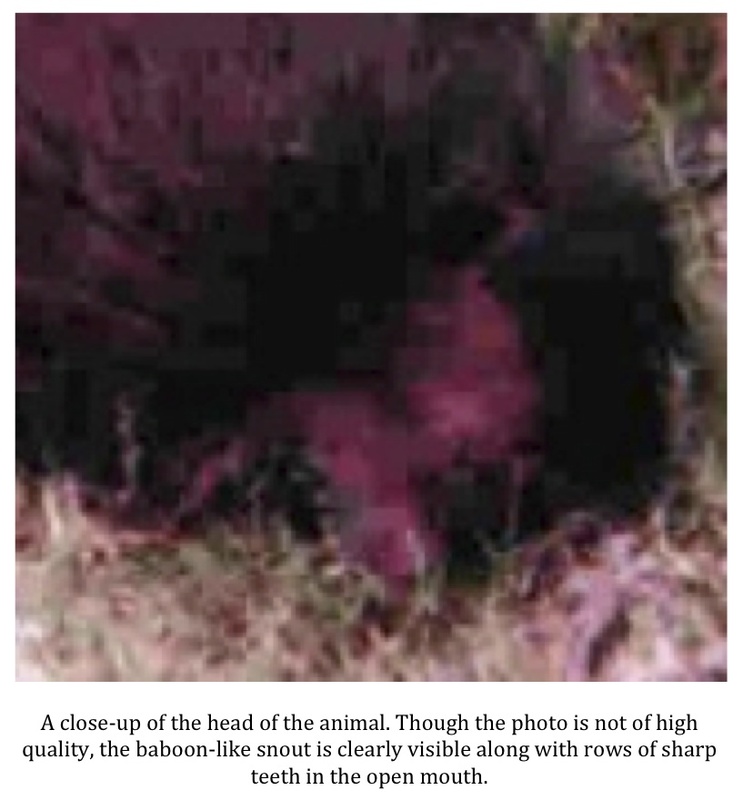 The analysis should, at the very least, tell us whether the animal in question was a feline of some kind (based on the scale pattern) and/or rule out other, more common, critters like a hog or a dog. Should the black hairs come back as belonging to a cat of some kind, they, along with the large sized described by the witness, will provide intriguing, though not conclusive, evidence that the black panthers of Texas might actually exist. I hope to have the results on the hairs back within 7-10 days. Within 24 hours of receiving this report, I was contacted for the second time by a woman living in the Waxahachie area who claims to have had a very close encounter with a very large black cat outside of her home recently. She continues to hear loud screams and roars, “like the sound of a woman being murdered,” during the night coming from the wooded area near her house. She has invited me to post a game camera or two on the property to see if we might get a photo of the culprit. To this point, however, weather has severely hampered my efforts to get up to her place and I have been unable to get the cameras placed. I’m hopeful I will be able to do so by the end of the month. Meanwhile, closer to home, I’ve received a report that a mountain lion has been spotted just north of Temple in the same vicinity where a couple of horse kills took place two summers ago. 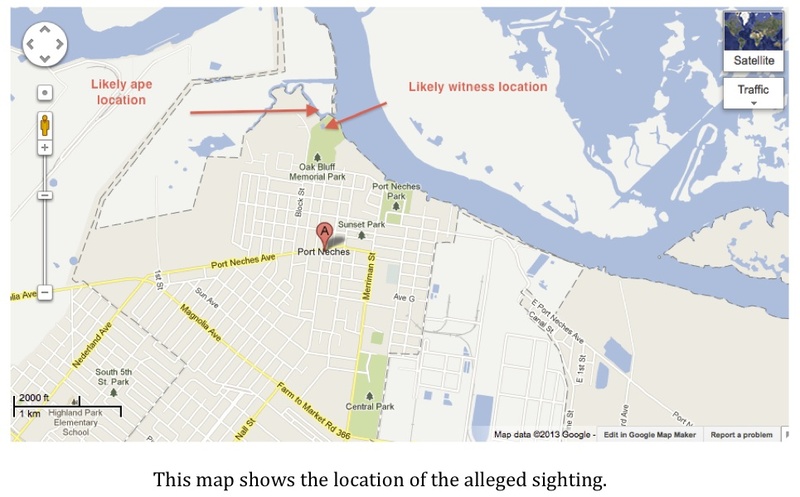 The witness said that the big cat was clearly seen at 7:30 a.m. just a few days ago and that a neighbor had lost a calf to a predator of some kind just two nights before that. It is possible this is the same cougar that was slinking around two summers ago. I will be posting cameras in this area as well but the same bad weather that has prevented me from getting up to Waxahachie has kept me away from this area as well. 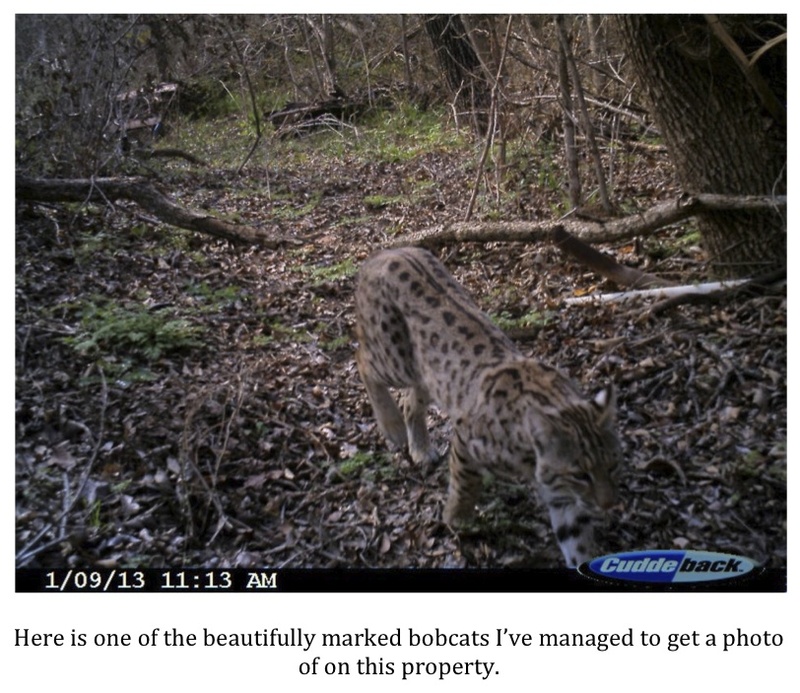 Once the weather clears and the creek on the property in question recedes a bit, I will get at least two cameras up in the hopes of finally getting the photo that proves mountain lions frequent this part of Texas on more than just an occasional basis. So, you can see there is a lot going on right now. Mix in my “real” job and the duties that come with being a husband and father and you have a pretty busy guy. I will provide updates on these stories and more as details become available. 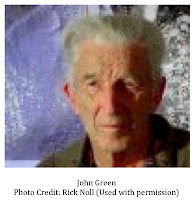 TBRC Chairman Alton Higgins, along with several other well-known figures in the Bigfoot community, received the following email from John Green, legendary researcher and author of "Sasquatch: The Apes Among Us", today. Take a look as it is well worth your time. "Although it appears to have been overlooked by all media for several years the material presented below will inevitably become one of the greatest news stories of the century. Sometimes it pays to be not a scientist. Dr. Aaron Filler, in his 2007 book “The Upright Ape,” presented ample evidence that all higher primates have been bipedal, walking upright on two feet, for over 20 million years. You don’t have to be a spine surgeon, which Dr. Filler is as well as being a PhD anthropologist, to see that a fossilized lower back vertebrae from an African site dated at 21 million years is almost identical to the corresponding vertebrae of a modern human. In a special edition of Scientific American dated Winter 2013 and titled “What Makes Us Human” none of the 16 authors showed any awareness of Dr. Filler’s book, and several had things to say based on the old mistaken consensus. But are not chimpanzees quadrupeds? They are plainly trying to be, but they can not really do it because they have the spines of upright animals. With their backs at an angle of about 45% they get around very well using the knuckles of their hands for front feet but they can not ever be normal quadrupeds because their spines do not have the proper attachments to keep them from buckling under load in a horizontal position. And what Dr. Filler does not say, even though he has presented the facts that establish it, is that there is now no shred of evidence that recent human forbears ever lived in trees. Two thirds of Dr. Filler’s book presents an historical overview and then outlines a new look at the origin of species which will undoubtedly be controversial, but the material regarding the origin of human bipedalism contained in the last two chapters is simple to understand and rock-solidly based on physical evidence. Until perhaps as recently as 100,000 years ago there lived in China, as established by three fossil lower jaws and a thousand fossil teeth, a giant ape twice the size of a gorilla. Since as a higher primate it must have been upright it matches perfectly the huge, very heavy, manlike footprints which human ingenuity is unable to duplicate, and the immense hair-covered bipeds that thousands of people claim to have seen in Canada and the United States. 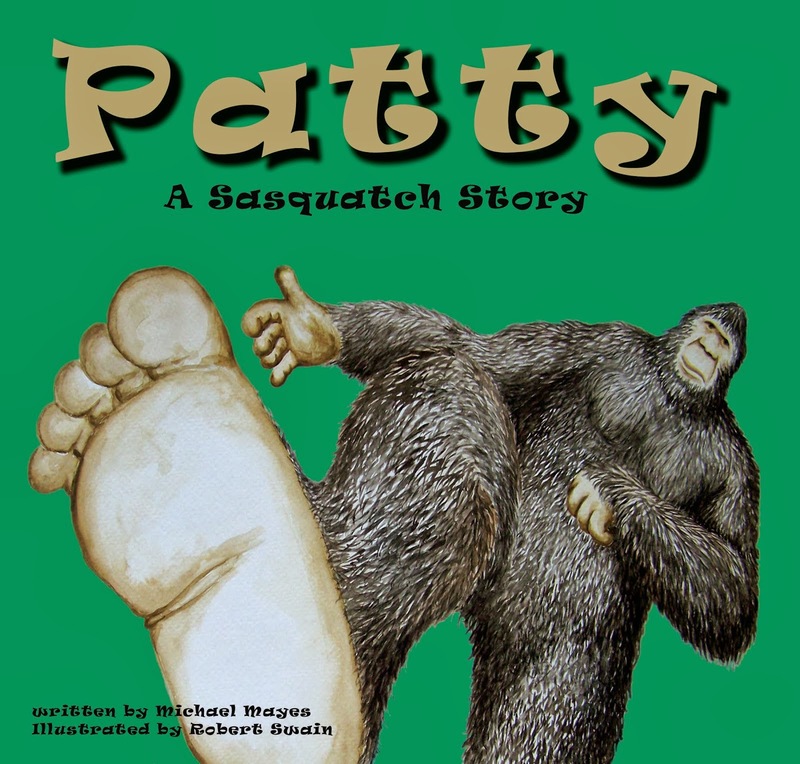 It follows that the many people who investigate Bigfoot/Sasquatch reports need to realize that their quarry isn’t likely to be some unknown creature sure to be a close human relative because it walks upright, but a proven animal that lived near the land bridge to North America and that already has a scientific name, Gigantopithecus blacki." "In 2007, my brother was talking to a man and his son that my brother occasionally worked with that lives in his trailer park in Edinburgh, Texas. The man and his son said they had been fishing in the canal behind the trailer park the weekend before. They said a giant bird landed in the canal a hundred yards from them and was wading around in the water apparently looking for food. The bird saw them and it wasn't afraid of them. It was wading towards them. The man said it was big enough to easily carry off the son, and they got scared and left. The man told my brother they will never fish there again." Since this was posted as a comment anonymously I have no way of contacting this person to ask any follow up questions. Obvious things like color, estimated size, was the head of the bird feathered or bald, how long were the legs of the bird in relation to the rest of the body, etc. will remain a mystery. Since this is a second-hand report, these questions would likely have remained unanswered regardless. As always, I cannot vouch for the veracity of reports that come to me in this manner. While I have no reason to believe this person is pulling my leg, I can't guarantee it. That being the case, take the report for what it is. If there is anyone else out there that has seen an unusually large bird I would like to hear about it. The term swamp monster conjures up different images in different people. Thoughts would range from the skunk apes said to roam the Florida Everglades to the reptilian lizard man that allegedly haunts the swamps of Lee County, South Carolina. Still others would, without a doubt, think of the terrifying images of the sasquatch-like creature, dubbed the Fouke monster, that terrified so many back in the 1970’s when The Legend of Boggy Creek made its debut on the big screen. For me, the first thing that comes to mind is the fictional paramafait that was featured in an episode of the 1970’s series Kolchak: The Nightstalker. The paramafait was, according to the episode entitled The Spanish Moss Murders, a legendary swamp monster that was humanoid in shape but much larger and more powerful than any person. It was covered in Spanish moss and decaying vegetation. Paramafait squeezed the very life out of its victims by enveloping them in a bear hug that crushed their chest cavities. The show portrayed the paramafait as part of Cajun lore; a legendary creature that parents frightened their children with when they failed to behave. The creature was all but invulnerable and could only be killed by a spear fashioned from the wood of a gum tree. The climactic battle between Kolchak, played brilliantly by Darren McGavin, and the swamp monster in the sewers below Chicago made quite an impression on a then 8 year-old future cryptid hunter. I wondered, years after viewing this episode, if paramafait was based on an actual Cajun legend. Having grown up in SE Texas in the Port Arthur area (Port Arthur is often jokingly referred to as the capital of Louisiana) I became well acquainted with Cajun culture. I have heard a lot of interesting tales from some old Cajuns. One has to be careful as these old timers are notorious yarn spinners and don’t mind “polishing up” a good story just a bit if it helps achieve the desired effect. Even so, I never heard anyone mention paramafait. I’ve looked often but have never found anything on this monster that connects it to anything but the old television show. It appears that paramafait was purely the creation of the Kolchak: The Nightstalker writing team. Having said that, it is entirely possible that the writers took some well-known Cajun folk tales and weaved elements of them together to yield the ultimate swamp monster that was paramafait. It is those tales I would like to examine now. One of the most prominent figures in Cajun folklore is that of the rougarou. The term is, no doubt, derived from the original French term loup-garou. Both of these terms are used interchangeably in French Louisiana. Where I grew up, I heard the term loup-garou more often but noticed, even as a young boy, that when the old-timers told tales of the beast, they used rougarou. The rougarou legend has been around for generations and likely migrated south with the French Canadians two hundred years ago. The rougarou is, for all intents and purposes, a werewolf. It was described in the past as a beast with the body of a man and the head of a wolf; however, the monster is described most often these days as a shape-shifting human that can transform into a massive wolf-like creature during the full moon. The rougarou is said to inhabit the swamps, marshes, and bayous of Louisiana and mindlessly slaughters any living thing unfortunate enough to cross its path. The tale, as is the case with almost all “boogeyman” stories, is most often told around campfires and/or to “encourage” obedience in children. One interesting twist on the rougarou legend is that the beast will actually hunt down Catholics who fail to observe the rules of Lent. Some versions of the legend actually claim that one way a person can be cursed and become a rougarou is by breaking the rules of Lent for seven consecutive years. 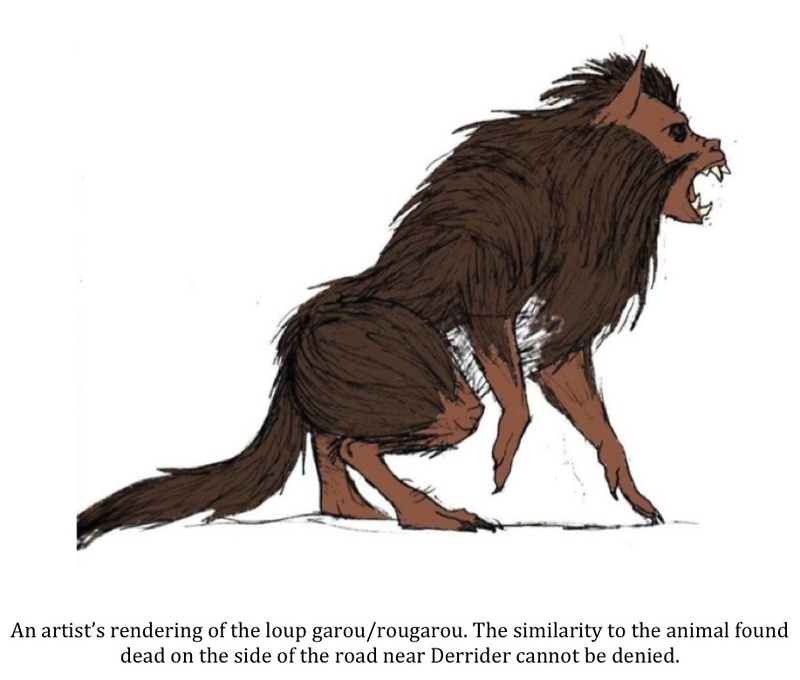 Most would consider the rougarou/loup-garou just another legend, a myth and nothing more. After all, there is no physical evidence to support the existence of such a fantastic creature. Back in 1996 The DeQuincy News printed a rather unusual story. It tells the story of a woman named Barbara Mullins who stumbled across something very unusual on the side of a rural Louisiana state highway. Mullins was driving down Louisiana State Hwy. 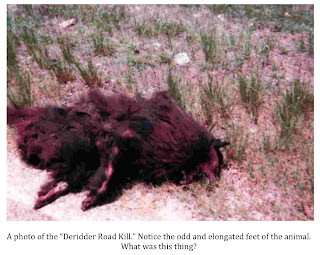 12 when she noticed what appeared to be the road-killed carcass of a large animal at the edge of the road’s paved surface. She decided to stop and have a look. What she saw amazed her. She described the animal as being roughly equivalent in size to an adult St. Bernard. The beast was covered with a thick, matted coat of reddish-brown hair. What really stood out to Mullins was the overall simian appearance of the animal. This didn’t look like any sort of dog she had ever seen. The snout was more like what one would see on a baboon than a dog. The ears of the animal were small and pointy: not dog-like at all. The feature that stood out more than any, however, was the very un-paw-like feet of the creature. They were long and elongated and looked much more like the feet of an ape than those of any canine. Mullins, unlike so many people who have had strange encounters, had a camera in the car and took several intriguing photos. I have to admit that the photos of the “Deridder Road Kill,” as the carcass has become known, are very interesting to me. The Louisiana Department of Wildlife and Fisheries wasted little time before stating the animal was nothing more than a Pomeranian dog. Others felt, due to the simian-like features present, that the animal was some sort of primate. Some ventured this was physical evidence proving the existence of none other than the legendary rougarou/loup-garou. Whatever the animal might have been will likely never be known. Even the photos themselves, intriguing as they are, are frustrating in that there is nothing in them to provide scale and, thus, verify the claim that the animal was the size of a St. Bernard. Was it just a Pomeranian dog that had gone feral or something more? Is this the real creature behind the tales about the rougarou/loup-garou? Of all the swamp monster legends, that of the Honey Island swamp monster might be the most intriguing. The Honey Island Swamp is a tract of bottomland lying between the East Pearl and West Pearl Rivers in SE Louisiana. The swamp covers about 250 square miles. Of that, approximately 70,000 acres have been set aside as a protected wildlife area by the Nature Conservancy. The swamp teems with life. Alligators, cougars, coyotes, waterfowl of all kinds, bald eagles, and even the endangered red wolf have all been spotted here. Some claim something else has been seen as well. “First time I ever saw it, it was standing plum still like a stump. I stopped and realized it wasn't a stump and it wasn't supposed to be there. When I stopped it ran. 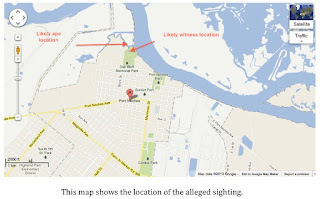 It was dark gray, about seven foot high, it jumped a bayou, that was the first time I saw it. The next time I seen him was swimming the river [Pearl River], two of them, one was bigger than the other and faster than the other and they swam just like a human with them long overhead strokes. I tried to get one of them to look at me and the other one ran off and the other one wouldn't look at me. I could've shot it but I wouldn't on account it wouldn't look at me. It looked too much like a human too me, broad shoulders, arms hanging down below its knees, hands looked almost like a humans." One of the things Williams says during his interview that catches my attention is his description of how the creature stood dead still, “like a stump,” until it realized it had been seen. Once it realized it had been spotted, the animal fled. This scenario has been described many times by alleged sasquatch witnesses (The creature in question is clearly a sasquatch-like animal). Another intriguing aspect of his second account is of the creatures swimming. There have been a handful of sasquatch sightings where the witnesses claimed to have seen these animals swimming. These reports were often dismissed at the time since it was believed no apes could swim. This has now been proven wrong (see my Great Ape Parallel Series). The claim of seeing a wood ape swim would have been deemed too outlandish to be believed back in the early 1970's even by those who believed in the existence of such creatures. Why would Ford and Williams say something they knew even monster hunters wouldn't believe? Ford is also among the first to mention the possibility that the creature might climb trees to escape detection. I have a copy of the Honey Island Swamp Monster DVD, a documentary produced by Harlan’s daughter, in which another man recounted a sighting to Ford. In a nutshell, the man said he saw the beast and then it just “disappeared.” The man could not believe the animal could have gotten very far in the time it took him to get to the spot where it was first seen. Ford asked him, “Did you look up? Never forget to look up.” It is little tidbits like these that lend credence to the stories of Harlan Ford. After Harlan Ford died in 1980, a reel of Super 8 film was found among his belongings. A segment of the film featured an upright creature walking right to left just inside a tree line somewhere in the swamp. You can see a snippet of the video above. His footage is one of only three pieces of video that I’ve seen that I believe may very well be authentic (I have another post in the works comparing and contrasting these three pieces of footage). Some dismiss the video as a hoax. I don't. I have reasons for feeling the way I do. I'll delve into those in a future post but, in the meantime, consider something. Wouldn't Harlan Ford, assuming he was a hoaxer after fame, money, or attention, have promoted his 8mm film for all it was worth? Wouldn't he have "gotten it out there" to television producers, newspaper and magazine editors, or even the local news stations? Why would he hold onto the footage and show no one? It doesn't make sense. Some might think Ford did have plans for the footage and that he died before he could realize his plans. I don't buy it though. I have no idea why Ford never shared the footage. Maybe he had simply achieved his goal of proving the monster was real. Maybe that was enough for him. 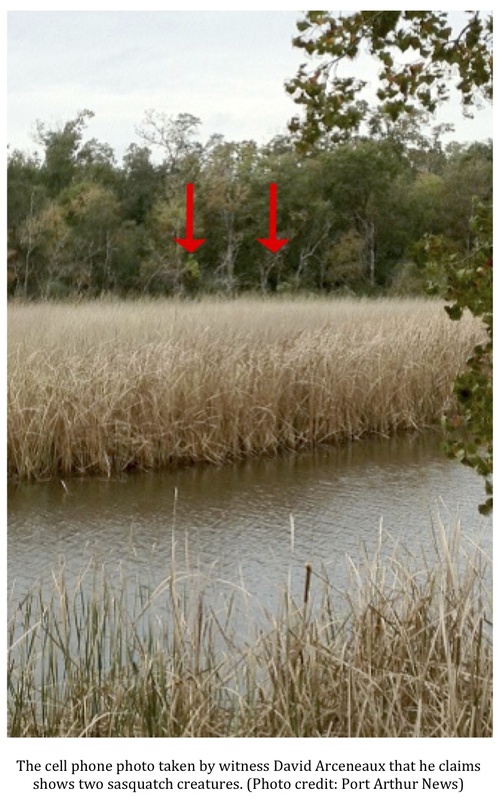 As stated above, the creature described by Ford and others in the Honey Island Swamp is clearly a sasquatch-like animal. It is almost universally said to be close to 7-feet tall, covered in hair, and bipedal. The colors described range from a grayish hue to the more typical reddish-brown. To bring this thing full circle, could the legends of the loup-garou/rougarou be based on sightings of sasquatches? 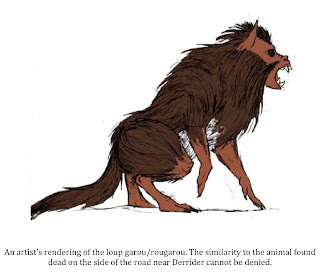 The descriptions of the beasts are similar in many ways: large, upright, covered in hair/fur, etc. Maybe the old Acadians that first settled these bottomlands were projecting their previous knowledge of the French werewolf to the unknown animal they were seeing in the woods near their new homes in the deep south. It is an intriguing theory. Tales of hair-covered, screaming, shambling bipedal swamp monsters aren’t going anywhere. Popular culture revels in these sorts of things. Bigfoot is used to sell everything from beef jerky to cosmetics. The Swamp Thing (DC Comics) and Man-Thing (Marvel Comics) both play off the swamp monster mythos to sell comic books. None other than Survivorman Les Stroud alluded to swamp monsters when he did an episode of his show from the Okefenokee Swamp of southern Georgia several years back. The movie industry will, no doubt, continue to churn out B-grade films featuring beasts that emerge from the creepy bayous and swamps to terrorize those who dare venture into their territory (usually scantily clad co-eds, it seems). Quietly, however, among all the noise about these monsters made by popular culture, compelling reports continue to trickle in from normal people who encounter something strange while hunting, camping, fishing, and/or hiking in the bottomlands of the south. The paramafait of Nightstalker fame may have been a figment of some writer’s imagination but real-life swamp monsters might not be. Think about that next time you venture into the bottomlands and realize there are more strange things under heaven and on the earth than we can possibly imagine. "Last night I was traveling back from Houston to Dallas on the back roads to avoid traffic. Around 9pm I was on HWY 90 south of Madisonville and hit a large black cat with my car. The animal was by my estimation about 80lbs and bigger than my English Springer Spaniel. I was traveling about 70mph with high beams on, it was clear, and I could see fine. But suddenly from the left side of the road it appeared and stopped just in front of the car, and turned to look at me. There appeared to be embankments on each side of the road and I discounted swerving or going in to the ditch to avoid it, So I hit the brakes hard. 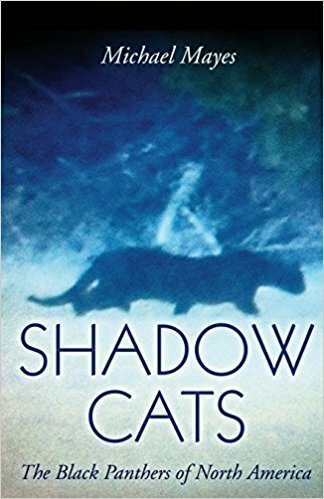 As I did the animal turned to face me and I saw clearly two blue eyes reflected back at me by my lights, and a clear feline face and large body. I think by the time I hit it the car had slowed to about 30-35 mph. There was a thud on impact, but I didn’t “run over it”, I think it went under the car. I pulled over about 50 yards farther and paused to take a look at the damage on my car. The front quarter panel was torn up and there was some fluids leaking and I noted some vapor clouds that smelled of radiator coolant. I determined that I needed to get in to town ASAP before the car was no longer drivable. When in town I assessed the damage and had to tie up parts and put extra fluid in the car and was eventually able to “nurse” it back to Dallas where I live. 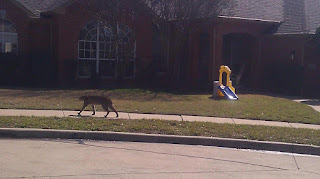 When I got home my wife and I did some research and I am convinced I saw and hit a black panther. I grew up in the Huntsville Area and as a teen heard stories of people seeing them in the area. This morning just before the care was towed away I inspected it again and found a collection of long semi-soft black hairs that had become stuck in the plastic, I have these and put them in a baggie. I am writing this to you to ask for any insight or ideas on how I can determine if in deed this was a black panther or if my eyes deceived me and it was perhaps a wild hog, or possibly a coyote. I am so sure that the face and head was that of a large feline, and I am mad now that I didn’t try to go look in the ditch for it, but I feared my car was failing and didn’t want to tangle with a large wounded animal should I find it. "The location was on Hwy 90, south of Madisonville, and just north of the County Road 106 cut off. As best I can recall, I know I had just crossed some small bridge and it the road side was dropping off sharp, or appeared when I saw the animal which , and looking at the maps on Google, I think the incident happened somewhere between the two little bridges you can see on Google maps." Here is where I'm in need of some help. I am unable to get out to this area for at least the next week. If there are any readers in this vicinity or any who would be willing to drive out to this area to check for possible roadkill I would be most grateful. The carcass won't last long on the shoulder of the road or on the edge of the wood line. If you are willing to get out there and take a look let me know. 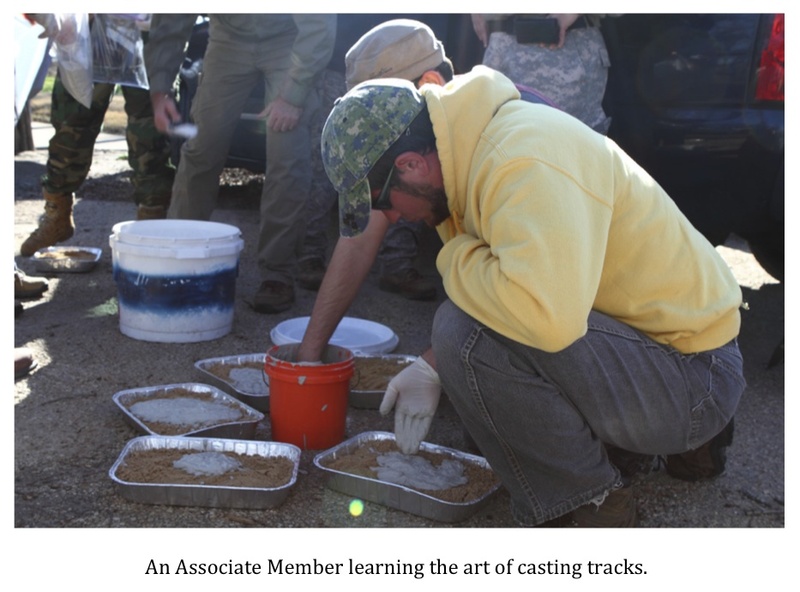 Pack a camera, some gloves, and a garbage bag or tarp just in case you find the carcass. Who knows? This could be the break we've all been waiting for when it comes to the black panther enigma. In the meantime, the reader has agreed to send me the hairs he collected from the front of his vehicle for analysis. These may yet yield some valuable information even if a body cannot be located.